We currently provide two vocationally based services from our Village site. These programmes enable people to gain confidence through participating as volunteers in learning activities using either horticulture and workshop skills as the medium. They can explore a range of skills and enter into associated training. There is a real team focus to these programmes and people develop immense commitment the projects that they are involved in. The Horticulture team, with anywhere from 4 - 8 places, undertake small scale voluntary garden work and maintain a large vegetable plot at the Village. They collect seed and raise seedlings for sale, and have a working relationship with Kuaka NZ Ltd, specialists in environmental and cultural field studies. Turning Point operates from a fully equipped workshop under the guidance of an expert tutor. 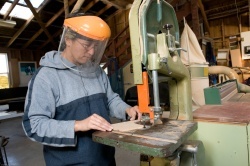 The tutor offers support to anyone wishing to explore woodwork or handyperson skills. From time to time a discrete team undertakes small contracts where the tutor can teach a range of skills in a work setting. We also provide small scale work opportunities for Turning Point members where they can undertake projects on and off site for real wages. This allows people to earn a little extra cash in a supportive setting as well as hone up on their work skills. The first step to entering either of our Vocational Services, any contract work or volunteer opportunities is to register with us and to contact the Sage Career Support Team at Turning Point on (07) 578 6443.